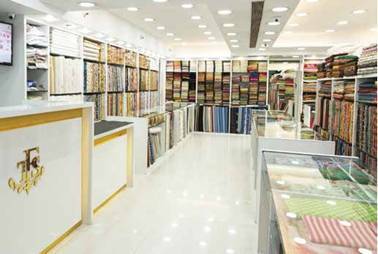 Lost in the din of furiously-debated issues and dwarfed by giant-size brands are the innumerable small-time stores and feisty initiatives that keep doing cutting-edge and exemplary work in the field of fabrics. Almost all of them don't waste their precious resources on advertising, and instead rely on the time-tested form of word-of-mouth publicity. That works wonders because such testimonials stand for credibility. Many of these diminutive businesses are suppliers to leading fashion designers, and embody something that big brands spend precious resources for: the trust factor. Meher Castelino profiles two such initiatives. The fabric business in India is usually familydriven. Therefore, it was not surprising that Vimal Doshi followed his family business in fabrics and started Vimal Textiles in 1999. The manufacturing takes place with exclusive weavers in Jamnagar, Varanasi and Bengaluru, but the company does import some fabrics from China-mainly 70 gm georgette on which the lucknowi chikankari is done. "Since the majority of Chikankari is done on georgette, we order nearly 2,000 metres per month from China," says Doshi, whose company creates a variety of fabrics. "We have our own weavers and factories in Lucknow, where the weavers weave in front of us. All our lucknowi/chikankari lehengas, saris, kurtis, kurtas and sherwanis are hand-made by them. We believe in promoting them and their talent, which also ensures employment for a number of female workers. Apart from that, we also have linen, khadi, georgette, silk and cotton." Nearly 1,000 metres are produced in a month, and Doshi is the creative brain behind the designs presenting six collections a year- with 15 new designs in each range. While Doshi doesn't like to reveal the names of top designers who buy from him, it's believed that Sabyasachi Mukherjee and Manish Malhotra are the company's regular clients. 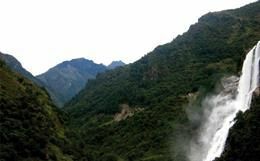 The minimum quantity is 50 metres and maximum 3,000 metres, but prices are flexible and affordable starting at ₹300 per metre and moving up to ₹3,500 per metre. The lead time is 45 days to weave 100 metres since the hand embroidery by karigars is done in different parts of India and requires personal quality control. "We ensure that the quality is 100 per cent authentic with just 10 per cent rejection, and that there is no mix of machine work or any other chemicals." When it comes to working with designers, their requirements are normally for an initial 50 metres for samples and then over 100 metres at a time. According to Doshi, there is a great demand for chikankari, linen, khadi, bandhani and chanderi-in that order. "People prefer more of pastel and earthy colours since those are in fashion and more appropriate for summer. Chikankari is one of the fastest moving fabrics. Apart from that it is linen and khadi in pastel shades." With nearly 20 years in the business, Doshi has never advertised or promoted the brand since word-of-mouth has been of prime importance to publicise his ₹2crore business. "Our clients are diamond merchants and a few retail shops like Milan and Vandana. We have thankfully established goodwill in the market; so, we don't require publicity anymore. It is always by word of mouth." 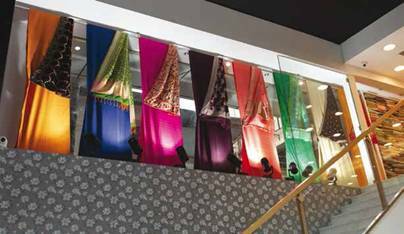 The fabric business in India is extremely competitive, but it does not perturb Doshi who states, "It is a little competitive. But since we already have a good client list, it doesn't make a difference. 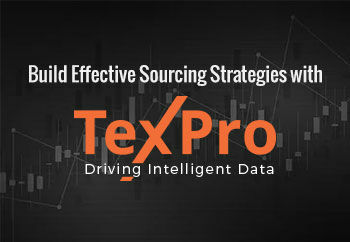 Just regularly staying updated with all the new trends and innovation is the key. The main motive that the customer has is to buy something that is worth spending on and creates a style statement. Our mantra is customer satisfaction and hence we customise according to their demands." With sustainability being the buzzword for fashion in 2019, Doshi admits, "Yes, we firmly believe and are absolutely proud to support the idea. 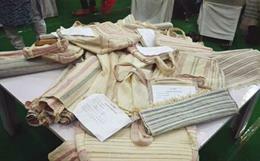 We are manufacturers of linen and khadi, and also try and ensure minimum wastage. We have a monthly visit where these fabrics are made, thus keeping a check and ensuring the quality with special inspectors appointed to do this. We keep tabs on the fabrics that we manufacture or import. 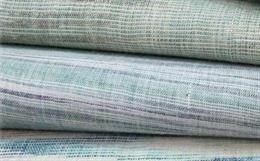 From the source of the fibre to the yarn, warp and weft count and the methods of weaving, we ensure that each fabric is suitable enough to be put in front of the customers. We do not believe in compromising on quality." 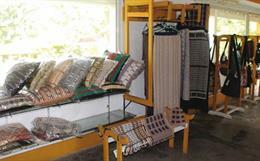 A minimum of 5 metres can be bought by customers with the fabrics and embroidery both being machine and handmade. "The linen is machine-made, but we are also manufacturers of pure linen. Khadi and chikankari are handmade. We cater to the demands of the customers; hence, we have a variety of embellished and woven fabrics. We have at any given time more than 7,000 samples of embellished and woven embroideries. We have our factories in Lucknow and we also have a unit in Bandra where karigars do machine and hand-embroidery on the khaat. Hand embellishments are in great demand since they look more exquisite in their appeal. 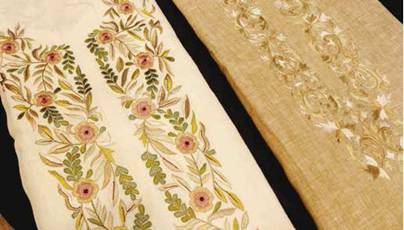 Hand chikankari, aari, zardosi, resham and mirror work are the most popular." 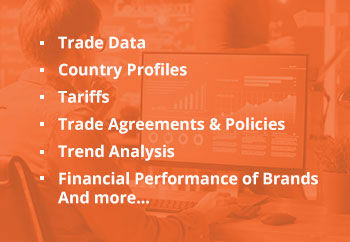 Besides this, nearly 300 metres per month are created as per customer's specific demands, which are exclusive as the company has policies to be maintained and contracts for confidentiality purposes. Doshi has watched the trends change over the years. 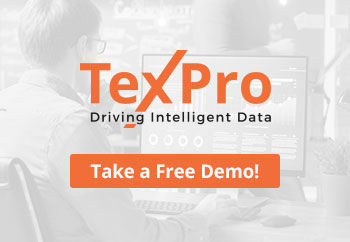 "Initially, customers were a little hesitant about spending, but now they are willing to spend more as long as they are satisfied with the work and quality. 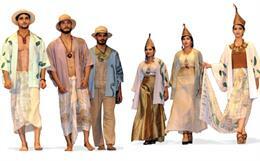 Although we do have a few NRI clients, our main ones are those who long for Indian ethnicwear." Staying ahead of international trends, Doshi adds, "Yes, there is a little competition since China is cheaper in fabrics, though it doesn't affect us much. I make regular trips to China and Hong Kong. I have a few contacts there and thus ensure that I stay updated. Indian fabrics are durable since they are more washable and eco-friendly as compared to the foreign ones." 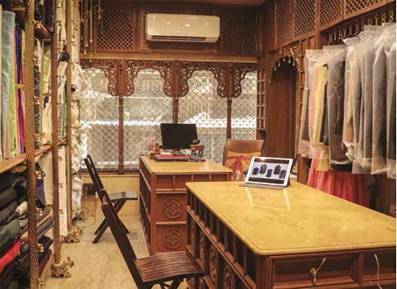 While fabric retailing is Doshi's main business, he reveals, "Since we are also manufacturers of pure linen, we specialise in reversible jackets, kurtas and blazers. We have a versatile range of styled pants. We have been in the industry for over two decades and have successfully established goodwill. Customer satisfaction is our utmost priority and we create exactly what they ask for." Designing and manufacturing fabrics has been a family business for SNA Fabrics and Silhouette Pvt Ltd since 1993 with Nailesh Mehta, director at the helm. In 2016, he started the Fabric Studio in Mumbai as a one-stop destination for textiles with daughter Saloni and her husband Abhishek Dhanuka handling it. "We have been in the textiles business for four decades," informs Saloni. The stylish ultramodern outlet in Mumbai's fashionable suburb Khar caters to needs of designers as well as fashionistas. The monthly production is 50,000 metres in a variety of fabrics and designs. For retail sale it could be just one metre, but when it comes to production of special designs it has to be a minimum of 25 metres per design. Delivery time depends on the quantity, but 10,000 metres of a design could take 45 days. "We would be very happy to share our experience with a designer who bought 3,000 metres of embroidery in single design, and we delivered it in just one week," says Saloni. The fabric collection at the Fabric Studio and on its website is huge. Dupattas are available in muga, tussar, silver zari, pure banarsi, kadwa weave as well as chanderi, chiniya, pure bandhani and khadi. Embroidered options start with hand sequinned, pearls, butti work along with linen handwork, mukaish, mirror work and silk embellishments. 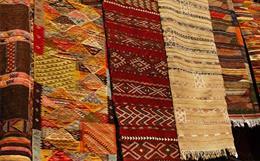 The banarsi line has woven checks, hand tie-and-dye, brocade, muga and tussar weaves with butta. The selection of prints is vast with digital prints on cotton, crape, habutai silk, tussar, ghicha and chanderi. There is also a line of fancy fabrics that include hand-ruffled, hand-pleated and sequinned hand embroidered designs on net. For a more plain set of options, there are tussar, cotton, raw silk, mul, georgette, chiffon and bhagalpuri fabrics. Ikats and patolas are also big sellers, while unstitched 3-piece zardosi and zari handwork suits as well as a vast line of readymade lehenga-choli, dupattas, kurtas, sherwanis and jackets are available for men and women. The fabrics start at ₹350 and move to up to ₹7,000 per metre. The ready-to-wear garments begin at ₹2,500 and go up to ₹1,50,000. The fabric production is in the company's looms in Surat, Varanasi, Bhagalpur and Bengaluru. 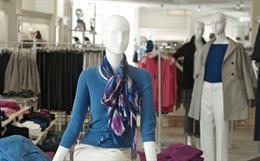 Colour masters create the fabrics along with in-house designers. The Fabric Studio's clientele comprises top designers. Ten new designs are created every week and the popular fabrics right now are silk chanderi, fine cotton, pleated, block prints, ajrakh and kalamkari with dusty pastel colours being favourites. "Our fastest moving fabrics are chanderi, raw silk and georgette, but it also depends on the season," adds Saloni. The turnover of ₹15 crore annually has 10 per cent reserved for promotions. The company uses its website www.thefabricstudio.in along with in-house social media that handles all promotions. "Word-of-mouth is the best recognised advertisement. We do have hoardings put up throughout the city, and also what has helped is sponsoring fashion events since exposure is the best way of learning more. It has helped us in many ways other than getting more business." Sustainability is important for the brand. "India is moving towards sustainably processed fabrics and we also try to create sustainable fabrics by different sources of technology and alternative energies. 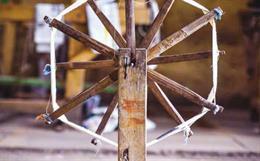 Some of the fabrics are created also using natural resources, like natural colours for printing. Our R&D department helps develop and maintain the quality in demand. We can supply a small quantity if needed-like 15-20 metres for embroidery and 25 metres for digital prints. To develop an embroidery design, it takes 2-3 days and we can make 20 metre per machine per day after the design is developed." Saloni feels trends don't have a past, but they are only improvised as per seasons. "We do follow foreign and Indian fashion along with upcoming colour trends and design concepts." Customised fabrics too are available. "We do customised designs as per designers' needs. Quantity depends on fabrics used, but anything between 25 and 100 metres is also okay to start production. Exclusivity is also maintained; every lady today wants to look her best in designer clothes. So not only designers, we also focus on giving the best service and quality to our walk-in customers as well with our countless designs that can satisfy any requirement." Competition from China and other Asian countries does not worry Saloni. "We provide a different quality and trendy stuff at reasonable and competitive prices, and I believe that both Indian as well as foreign fabrics have the same durability. We don't agree that foreign fabrics are favoured since in India people are very aware of quality and we maintain it. All fabrics go through various quality checks. Most of the fabrics we sell are manufactured in our own factory. We keep a proper QC (quality control) at the production level. So, rejection rate is very low."